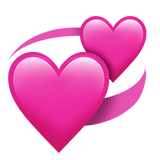 💞 Revolving Hearts Emoji is the image of two pink hearts revolving around each other. This can mean that you are fall in love. With this emoji you can show that you have an extremely romantic mood, or designate the object of your adoration. The heart has long been a symbol of love, so two hearts can mean that the power of love keeping us together forever. It's more of a romantic smiley than a flirt. Revolving Hearts Emoji was approved as part of Unicode 6.0 standard in 2010 with a U+1F49E codepoint, and currently is listed in 😀 Smileys & Emotion category. 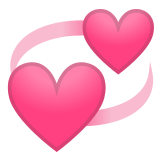 Use symbol 💞 to copy and paste Revolving Hearts Emoji or &#128158; code for HTML. This emoji is mature enough and should work on all devices. You can get similar and related emoji at the bottom of this page.